Breakfast, the big meal of the day should always be something filling and nutritious. But, unfortunately many miss this big meal of the day, giving various reasons. First and foremost of them is No Time. Being healthy or eating healthy is not for a day or two. It is also not a program to be followed for a month, it is a lifestyle change, you should prepare yourself to let go of all the bad eating habits you have so far considered as good or healthy. This process will take time, patience is more important, once you are aware of what is good and suitable for your body, then achieving good health is around the corner!!!! 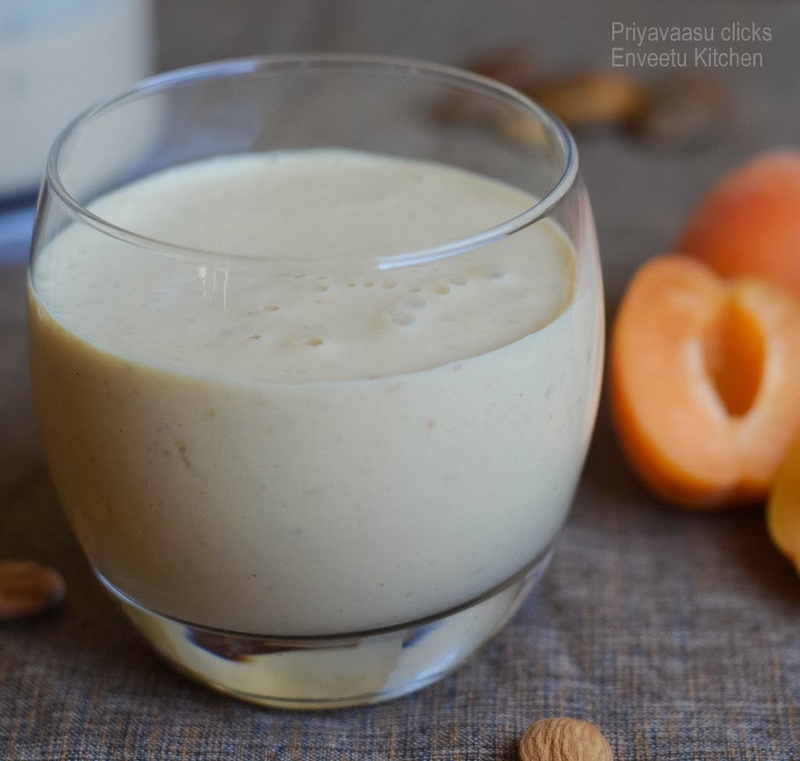 For those, who give time as the reason for skipping breakfast, we have these super fast and delicious breakfast served in tall glasses called Smoothies. 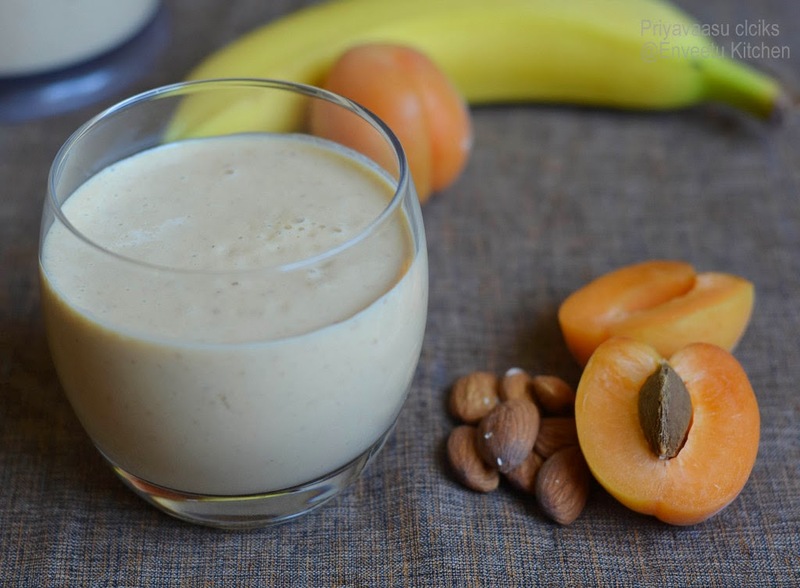 Smoothies with fresh fruits blended along with milk/yogurt or even non-dairy milk gives you all the energy required to breeze through the whole day. Last week i got some fresh apricots from the market. I have never tried fresh apricots until last year. 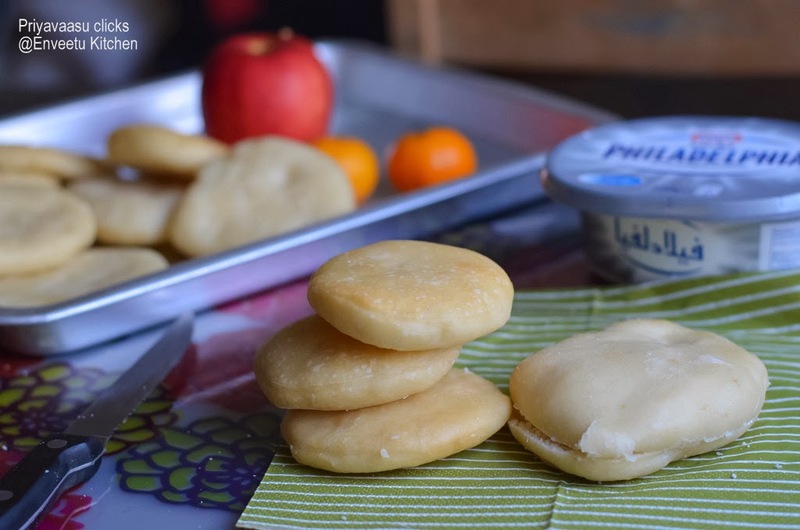 The first time i bought them i was a bit hesitant to try it for myself, so i gave it to my hubby dear who is game for fresh fruits anytime, he just loved them and assured me that it is awesome. You should be lucky to get sweet apricots, coz sometimes they are a bit sour. I just hate that sour taste when i take a bite into the fruit! uhhh! 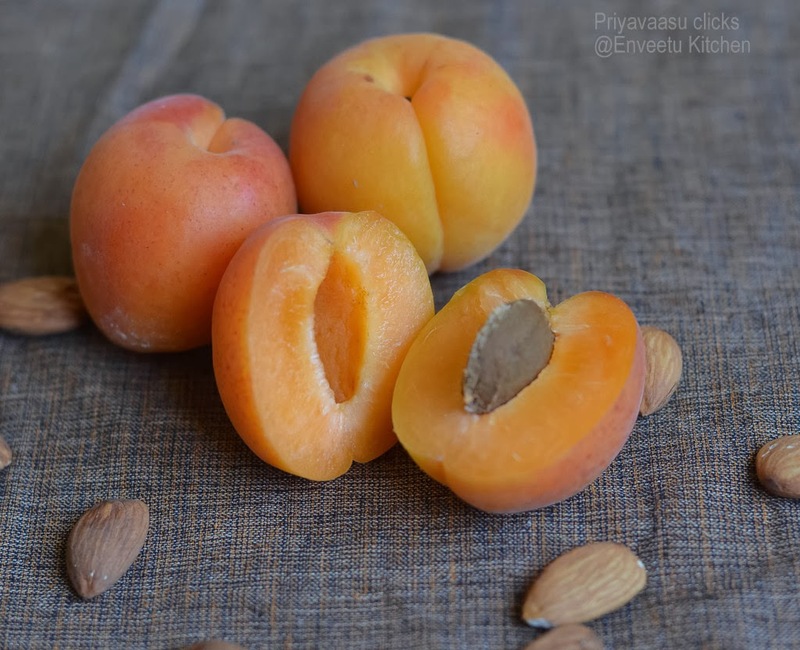 Remove the stones from the apricots and cut them in to small pieces. Peel and cut the banana in to chunks. 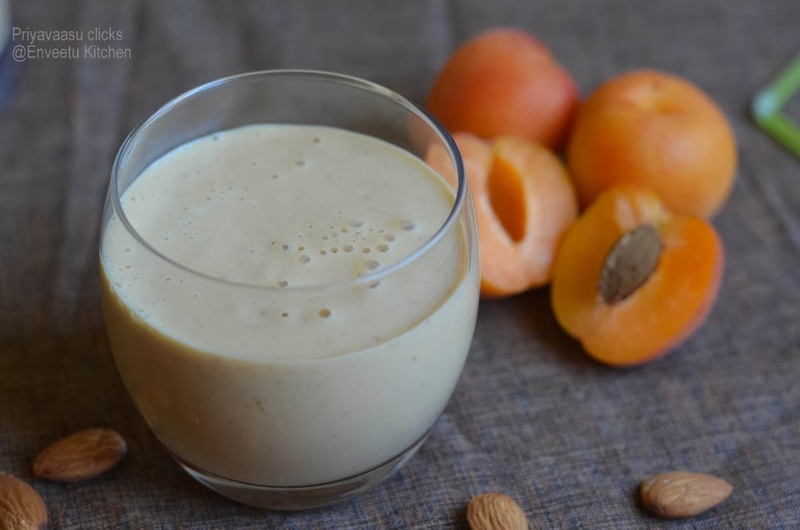 Take the cut apricots, banana, oats, almonds and yogurt in a blender and blend until smooth. If adding honey, add it at the end, blend once and serve immediately. If serving later, do not add honey. Refrigerate the smoothie, tightly cling-wrapped in serving glasses. Add sweetener just before serving. 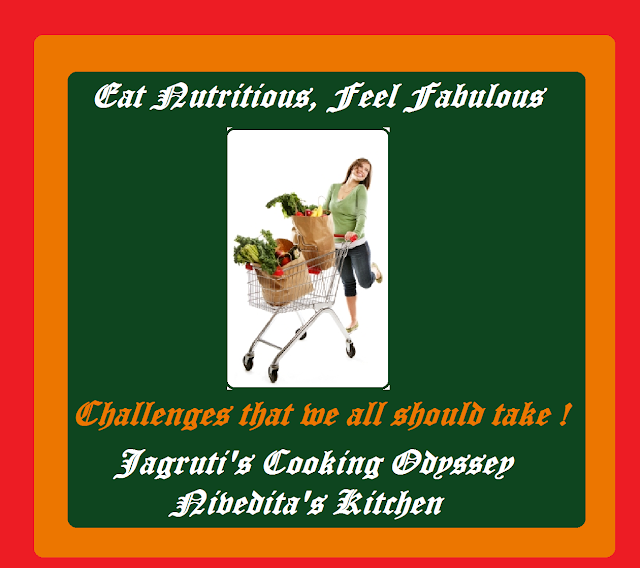 Sending this to Eat nutritious, Feel Fabulous, a monthly challenge happening @ Jagruti's space. 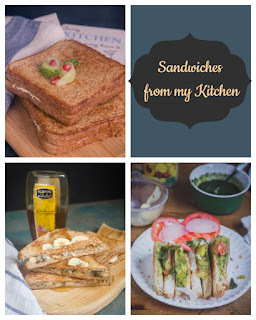 For the third week of Blogging Marathon i m doing combo dishes. There are some dishes, which taste awesome only with certain accompaniments, so for the next 3 days i will posting such awesome recipes. 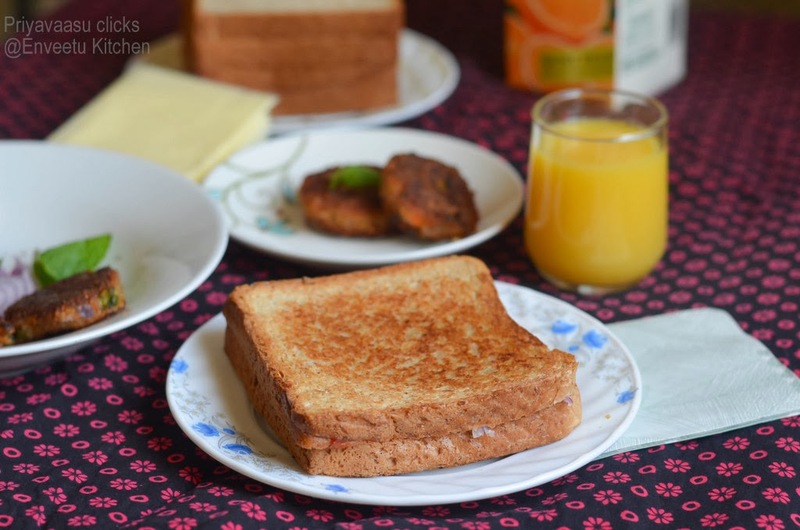 For the first day, i m with a breakfast recipe. Sandwich and Cutlet. 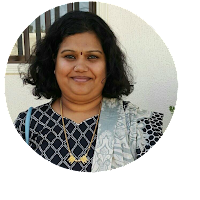 I was first confused on how to serve, thanks to Vaishaliji, she helped me with that. 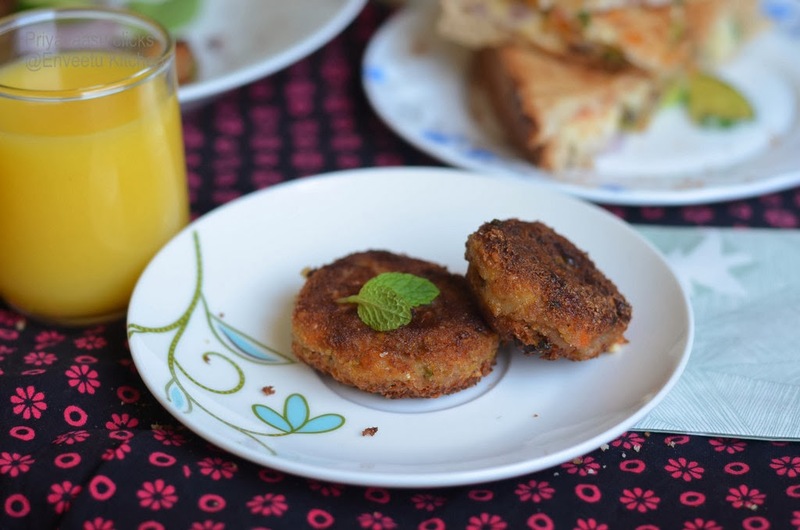 A simple vegetable cutlet,served along a onion-cucumber sandwich. But my family didn't prefer it that way, so i served with the cutlet stuffed in the bread along with some cheese. It was a yummmy breakfast and will also be a wonderful snack along with tea. Peel Potato, Carrot, and chop them into cubes. Take it along with other veggies in a Microwave-safe bowl, add a cup of water, and Cook @ high for 12 minutes. Drain the excess water. Do not waste it, add it to some curry or soup. i added it to my rasam. Let the veggies cool for 5 minutes. Mash them well using a potato masher. Next add the seasonings, red chili powder, coriander powder, add 1/4 cup bread crumbs, corn flour and salt. Finally add sesame seeds and mix well with your hands. Take the remaining 2 tbsp bread crumbs in a flat plate. Make golf-size balls of the vegetable mixture and flatten them slightly to make a patty. 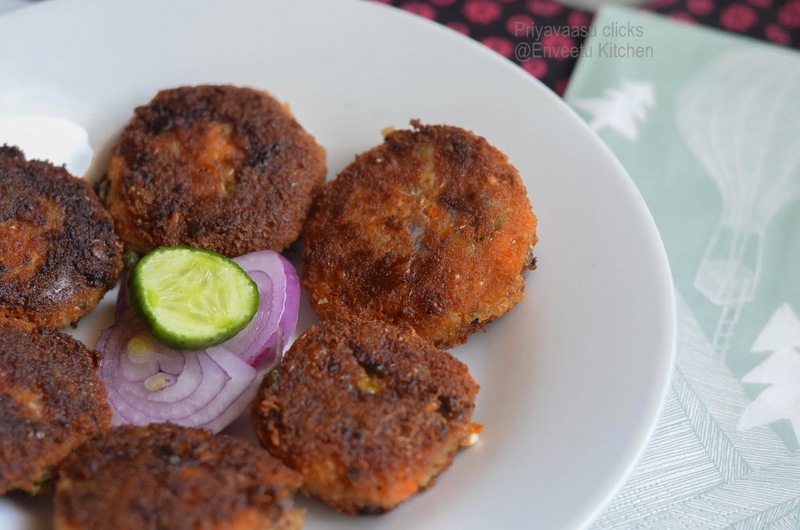 Roll the patty in the breadcrumbs and place it on a flat plate. 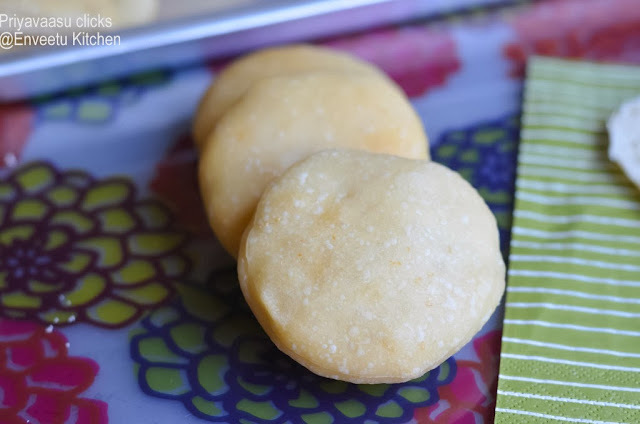 Refrigerate the bread crumbed patties for 20 minutes. After the requiredtime, heat a pan, add 2 tsp oil to the pan and pan fry the patties in batches. Do not crowd the pan, i cooked 5 patties at a time. Cook them on both the sides until crisp. Drain on a paper towel. Take 2 slices of bread. 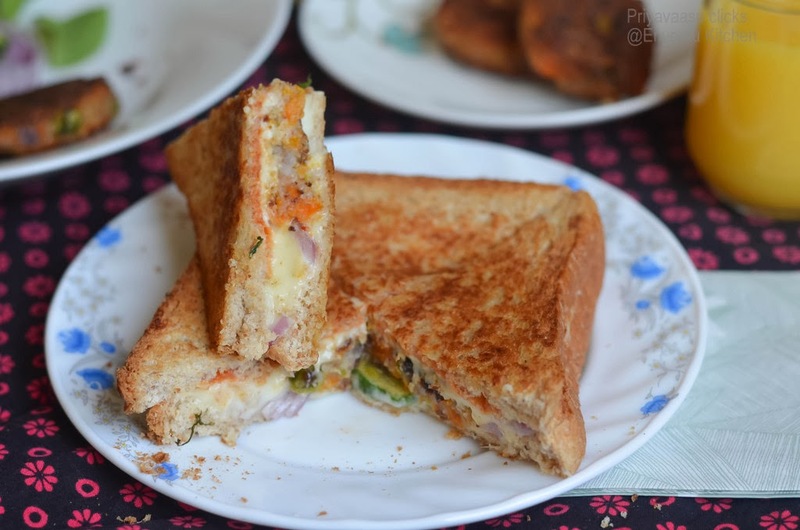 Squirt little sauce on one side of a bread slice, place a cheese slice, top it with a cutlet and 2 slices of onion and cucumber, close it with another cheese slice and a bread slice. 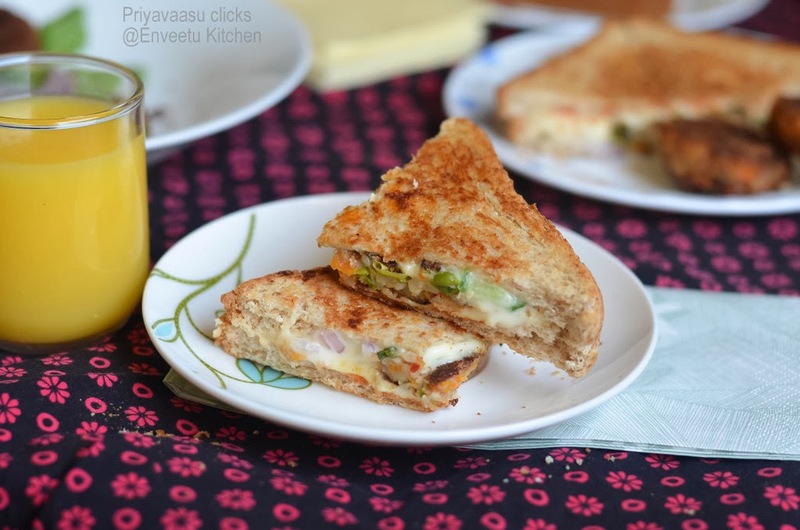 Toast the sandwich on a hot gridle with or without butter until crisp on both sides. Slice and serve hot.If packing, make an X on top, to ease picking and eating, pack it in alu-foil. Home Baker's Challenge for the month of January was a list of french bakes suggested by +Priya Suresh. It was really tough to chose one from that list.Finally i chose to bake Faluche Du Nord a traditional bread from Northern France. Here is a little history about this bread, Faluche is a traditional bread in the Nord-Pas-de-Calais region of northern France and the Tournai region of southern Belgium. Faluche is a pale white bread that is soft and fairly dense. It is neither a round nor flat bread but looks somewhat like a small deflated soccer ball. It may be eaten hot at breakfast with butter and jam or with cream cheese and smoked salmon or later as a snack with butter and brown sugar or with brie cheese. 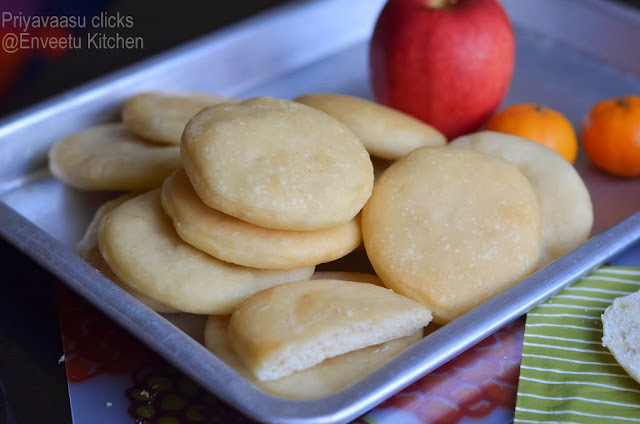 Faluche is made with white flour, baker's yeast, water, a little salt and oil. In a bakery, faluche was often baked as the oven was just heating up before the main baking. It is quite an easy bread to bake, only point to remember is not to bake them for long, as Faluche's have a white crust. Take Flour, instant yeast, sugar and salt in a large bowl. Mix well to combine. Slowly add luke warm water and knead to form a dough. While kneading add oil and knead well to form a smooth and soft dough. Cover the dough and let it sit in a warm place for 1.5 hours to proof. Since it is a bit cold here, i preheated my oven to 150C, left the dough inside with the lights on. If the climate is very cold the dough might need a bit more time to proof. Mine took about 2.5 hours to visibly puff up, though it wasn't double the volume. Remove the dough from the bowl, sprinkle enough flour in a working surface. 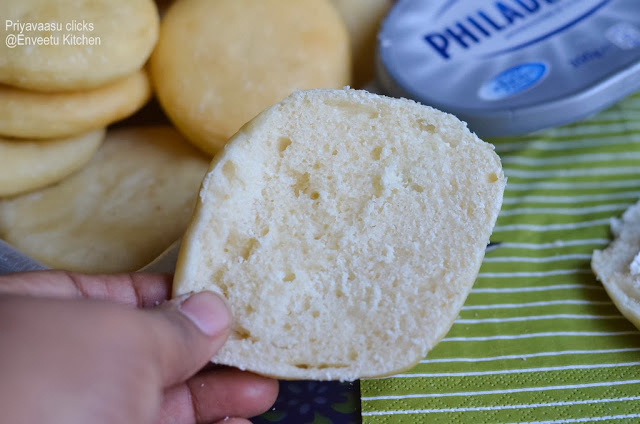 Roll the dough as a large disc/rectangle of about 1/4 -inch thickness.With a round shaped cutter, Cut the bread into rounds. I used my cake ring(3.5 inch diameter) for the same. You can even divide the dough into 6 even balls to make burger-size buns out of it. Let the shaped buns sit for another hour. Preheat the oven to 350F/170C. Brush the top of the faluche with the oil. Sprinkle some flour on the top and bake for 10-15 minutes. 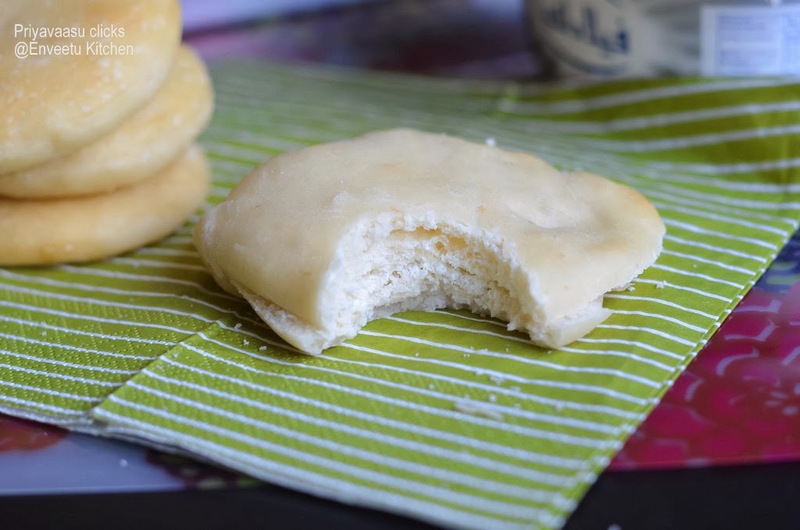 Faluche should have a white crust, so take care not to bake for a long. 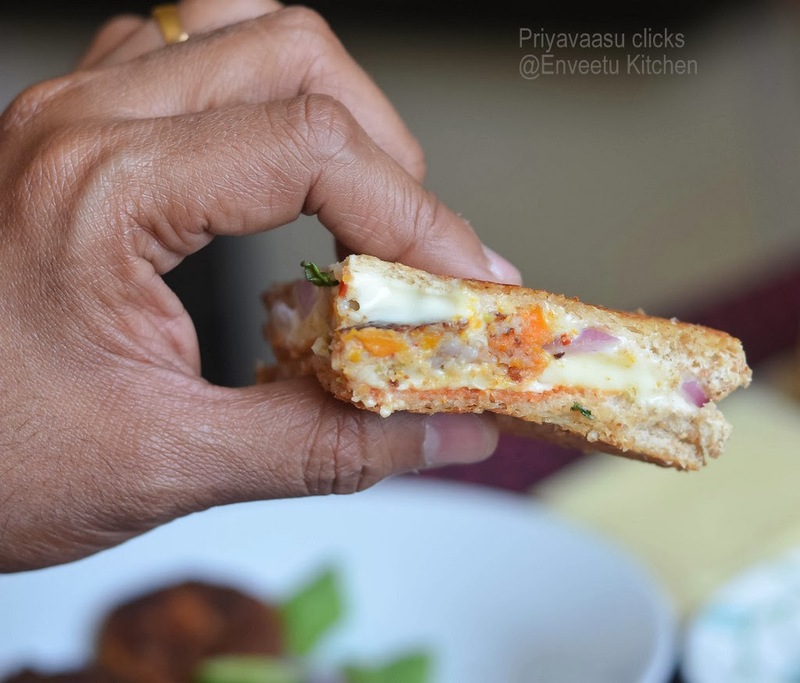 Let the baked bread cool completely on a wire-rack, serve it for breakfast with some cheese or Jam of your choice. I stored rest of the bread in a ziploc pouch in the refrigerator and used it up for next 2 days. There was once a time, when i used to by ready-made dhokla mixes. 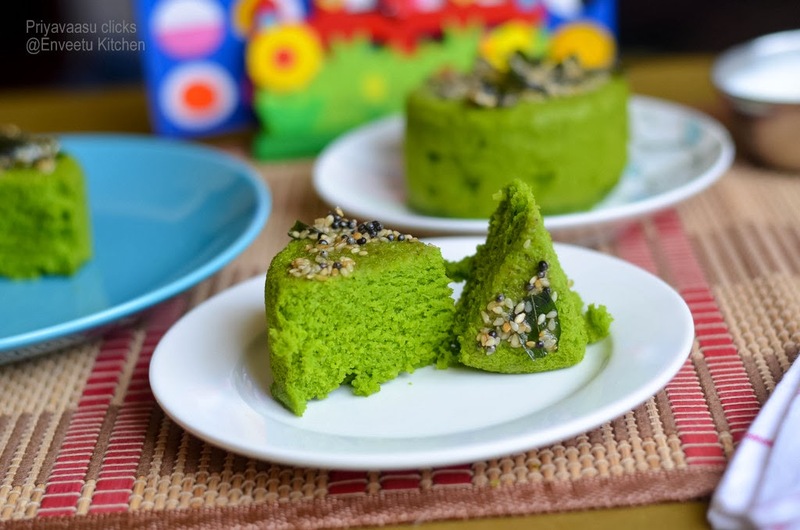 But, after trying Khaman Dhokla once, i just think how silly of me to buy ready-made stuff, when it is so very easy to make it at home. 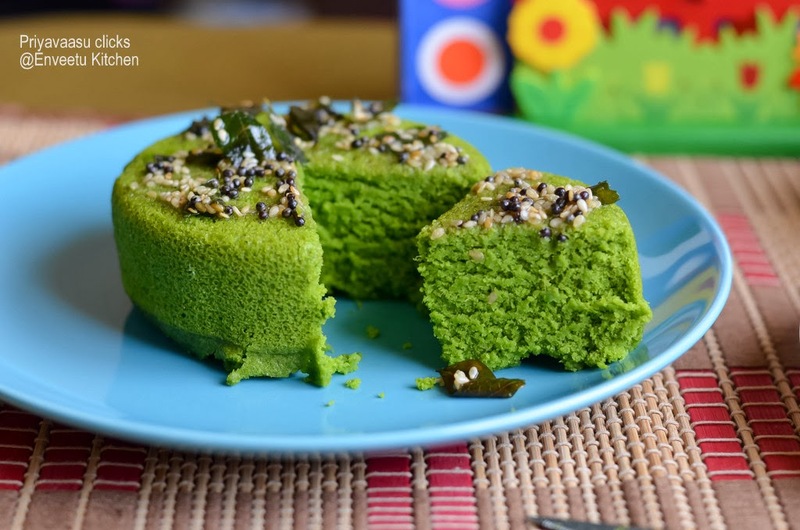 Now, i m trying different variations in dhokla.Since I m blogging on oil free/less-oil (just 2 tsp) breakfast for this week's BM, I thought dhokla would be a better option to make. 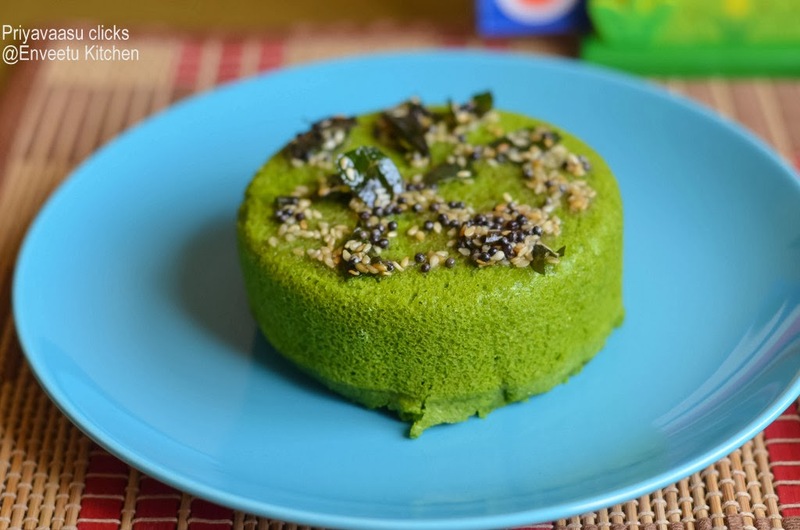 The other day, while watching Foodfood channel, I saw this spinach dhokla on a breakfast show, I immediately wanted to give it a try. The original recipe has some methi leaves too, but I was a bit hesitant to add worrying the final dish might taste a bit bitter. Loved the color it gave to the dhokla. When i opened the cooker to remove the dhokla, I was so happy see the cracks on top and the fluffy dhokla smiling! !! 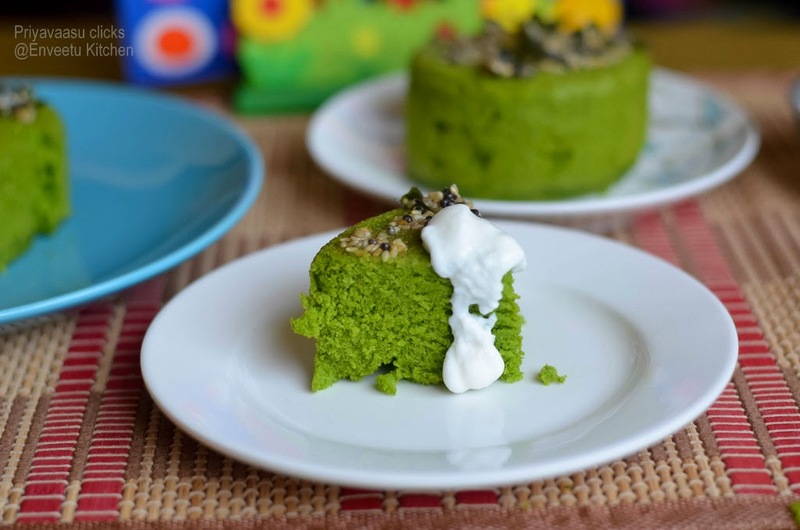 A great way to sneak greens into your kiddo's meal. I made it a little spicy and paired with some yogurt, oh yum, it was one filling breakfast. Take green chilies and ginger along spinach/palak in a mixer and grind it to a fine paste, without adding water. 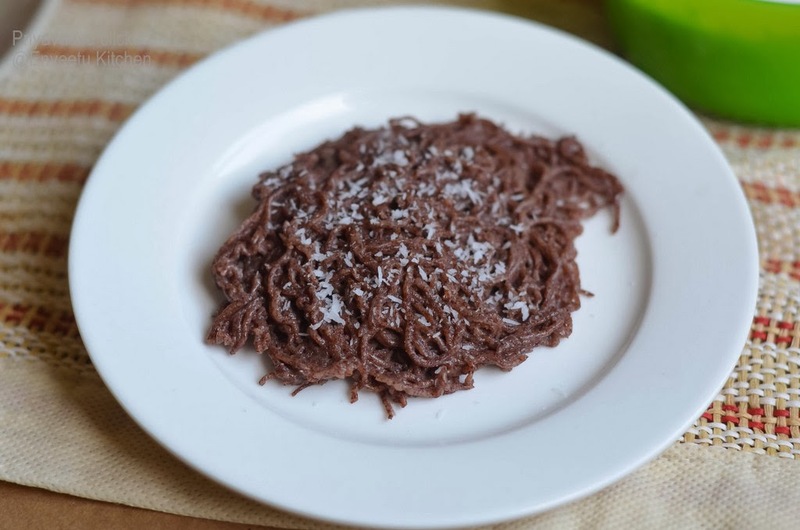 Take this in a bowl, add rest of the ingredient, except the baking soda ,and mix well adding water to make a thick batter.Just before steaming, add the baking soda. Give it a brisk stir. Pour the batter immediately into a greased thali.I used my stainless steel coffee bowls for steaming, wanted to have a shape like cake for the dhokla. You can also use flat plates. Steam for 12 to 15 minutes or till the dhoklas are cooked. Keep aside. Heat the oil in small pan and add the mustard seeds.When the seeds crackle, add the sesame seeds, and asafoetida, mix well and sauté on a medium flame for a second, while stirring continuously. Remove from the flame, add 2 tbsp of water and mix well. Pour the tempering over the dhoklas.Cool slightly and cut into equal pieces. Serve immediately with a bowl of curd. If serving late, heat it in a microwave for 20 seconds and serve warm. 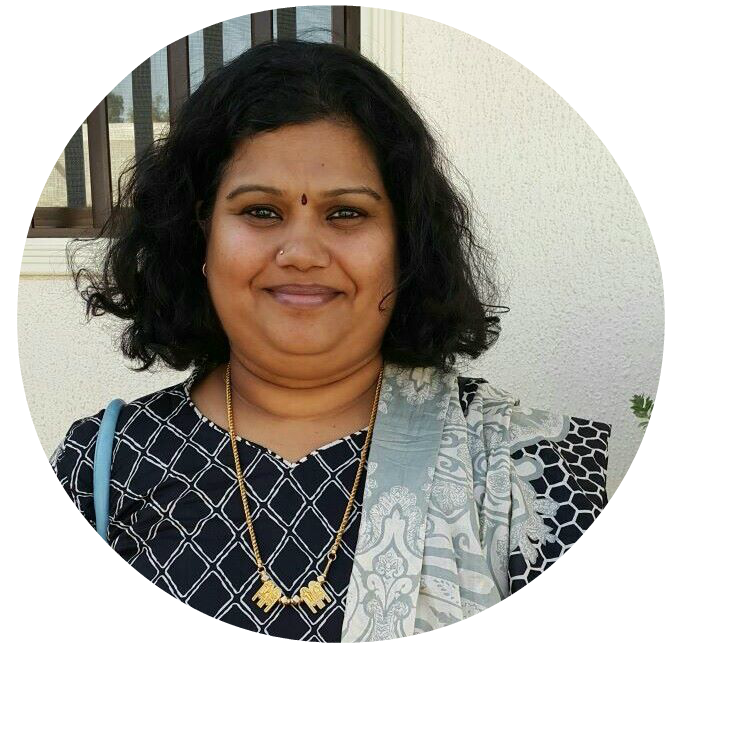 This goes to Cooking from Cookbook Challenge, January Week-2, happening @ +Srivalli Jetti space and also to Let's cook with greens happening @ +Nayna Kanabar's space. my whole routine was upside down. Coz, i normally get up early to pack his lunch and complete whole cooking by 7:30/8:00 am maximum and do rest of the work later. These 15 days, my routine was totally messed up!!!! So, his first day of school in 2014, i asked him what he wants for breakfast, he immediately told Pongal!!!! Though i expected dosa, since i had batter ready in the fridge. 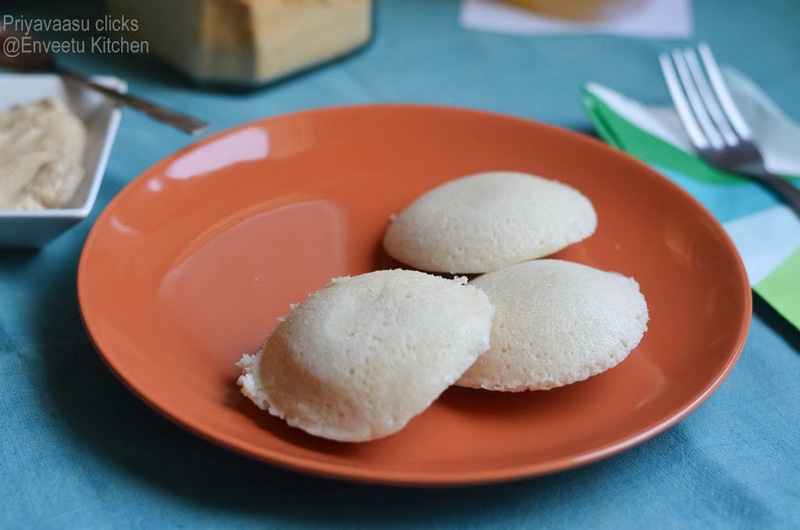 But then pongal isn't that tough to make in the morning!!! 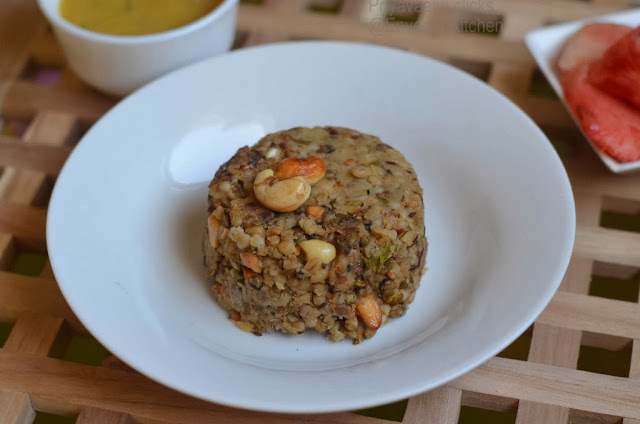 Since these days, i m experimenting with non-rice breakfast for the whole family, i made this barley pongal today. It tasted pretty much like regular pongal. Kuttu and his daddo didn't even realize the difference. 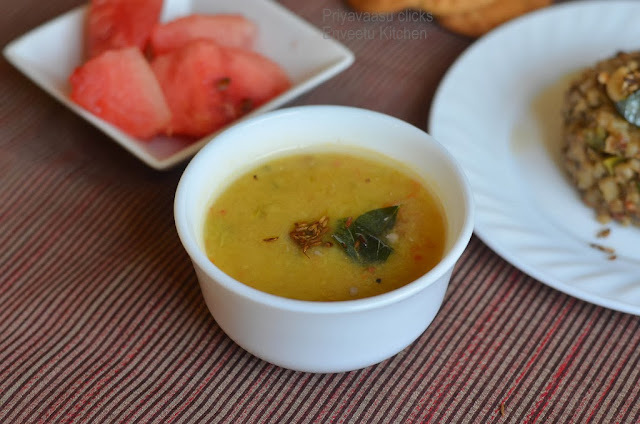 With a big bowl of sambhar this pongal makes a wonderful breakfast option, that keeps you full for a longer time and also delivering the wholesome goodness of wholegrains!!! Wash moong and barley once and soak in a cup of water for 10 minutes. 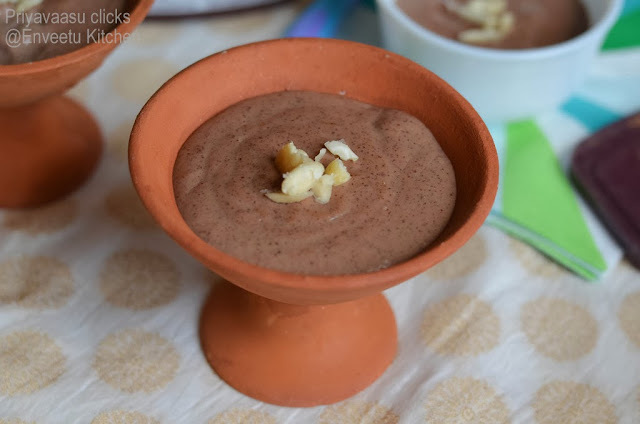 In a pressure cooker take barley and moong along with water and milk. Add pepper, green chili, turmeric and salt. Mix well and pressure cook for 5-6 whistles. When the pressure releases, heat a kadai with ghee given under "Tempering". Add cumin , curry leaves and hing. 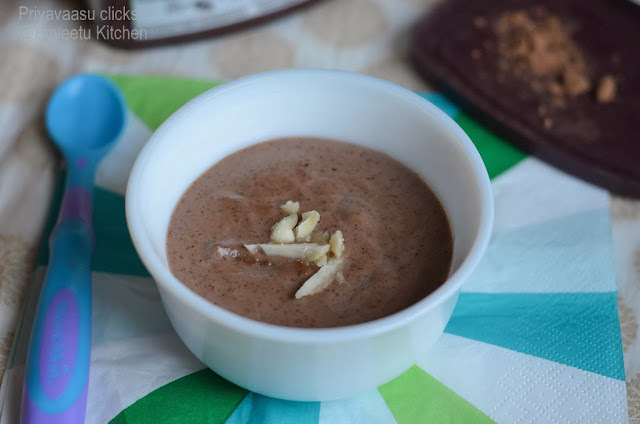 Add cashew nuts, when it turns brown, add the cooked pongal to this mix well. 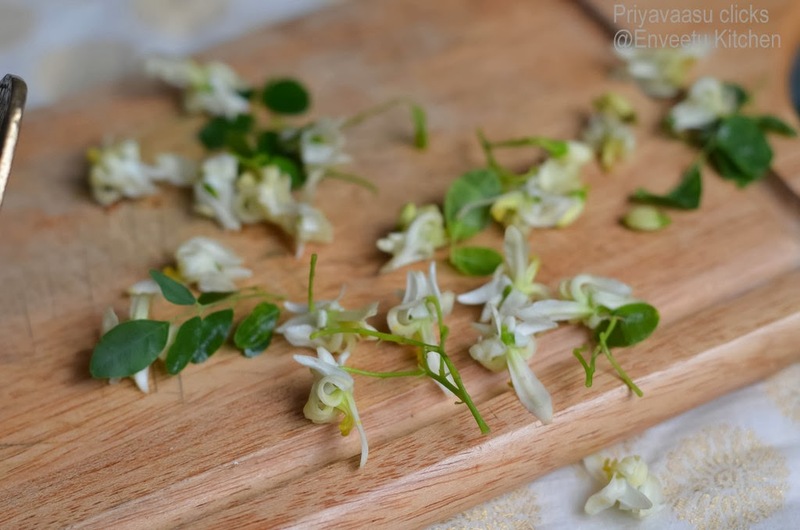 Garnish with freshly grated ginger. Serve hot with Sambhar and Chutney. Recently i have started experimenting with different type of dosa's for our breakfast. Why only dosa's? 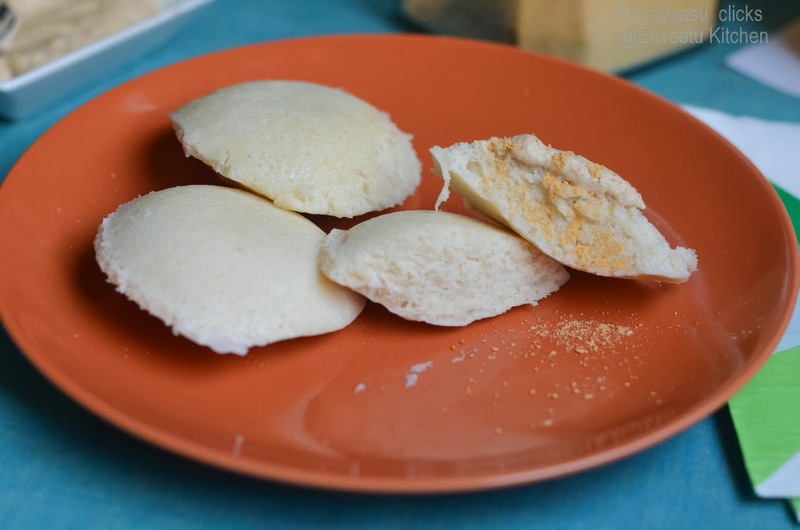 yes, if you are following me for quite a time, then you must be aware that my kuttu loves dosa, though he never gets bored of the same old dosa everyday,but i can't!!!! So, i m constantly searching for different dosa recipes and been quite successful in making my kiddo's too enjoy them. Kuttu always stresses that the dosa should be light brown(original dosa color), so apart from barley dosa and barley adai,this is the other dosa he prefers to have.. 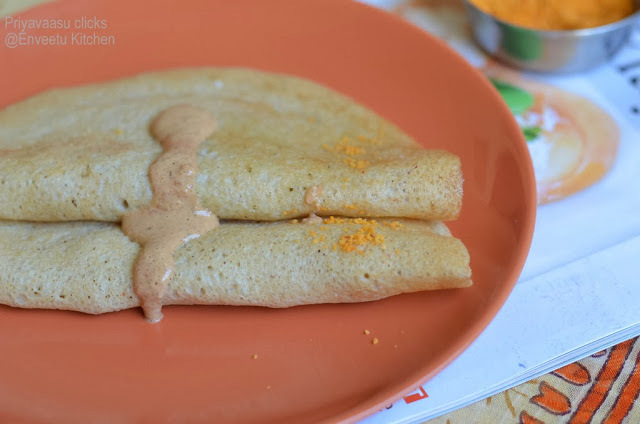 The first time i tried this dosa, i added little bit of rice, may be i messed up with the measurements or was it my pan, the dosa got stuck to the pan. Since i use a Iron tawa for dosa's and roti's, it was even more tough. 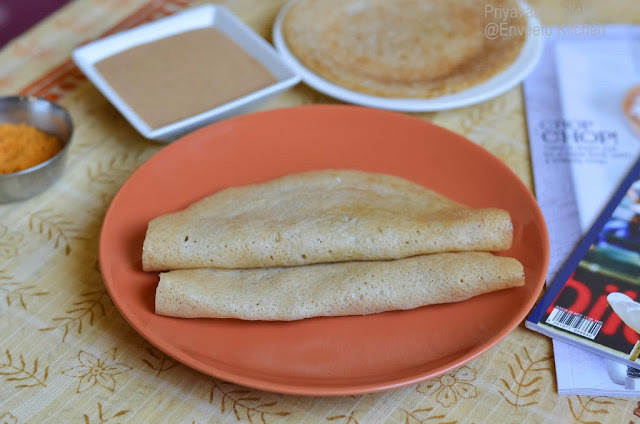 I had to use my non-stick appam pan to make dosa's. So this time, i tried it without adding rice and kept my fingers crossed while making the dosa. It came out good and tasted yum too. I personally felt that 3 medium dosa's with a good amount chutney/sambhar, keeps you full for a longer time. 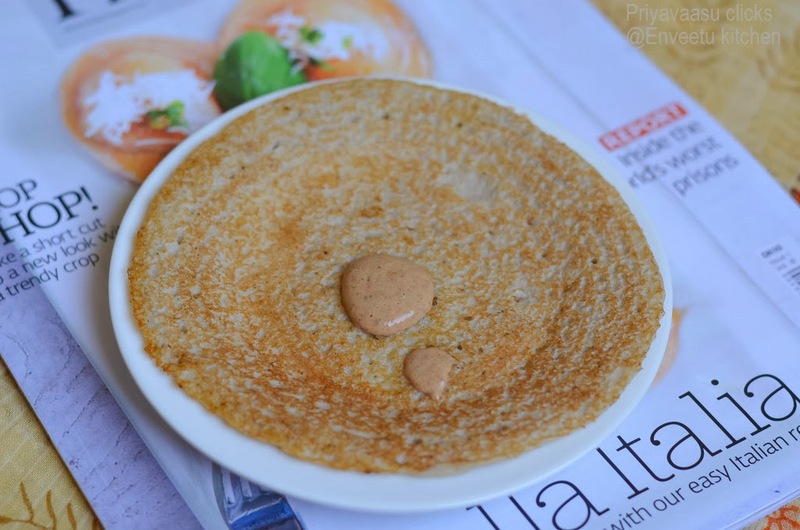 I would suggest using ghee for making the dosa's, gives a good taste. Soak jowar and urad dal separately for 3 hours. 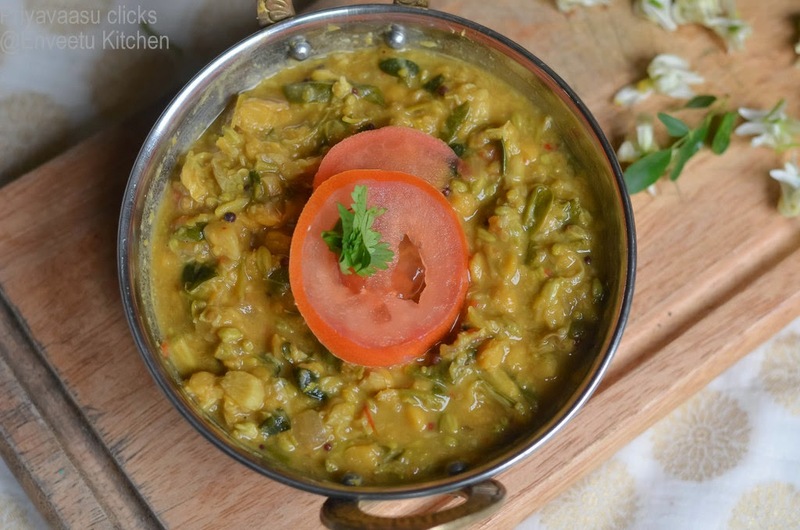 Soak methi along with urad dal. After the soak time, drain the excess water from both Jowar and urad dal. 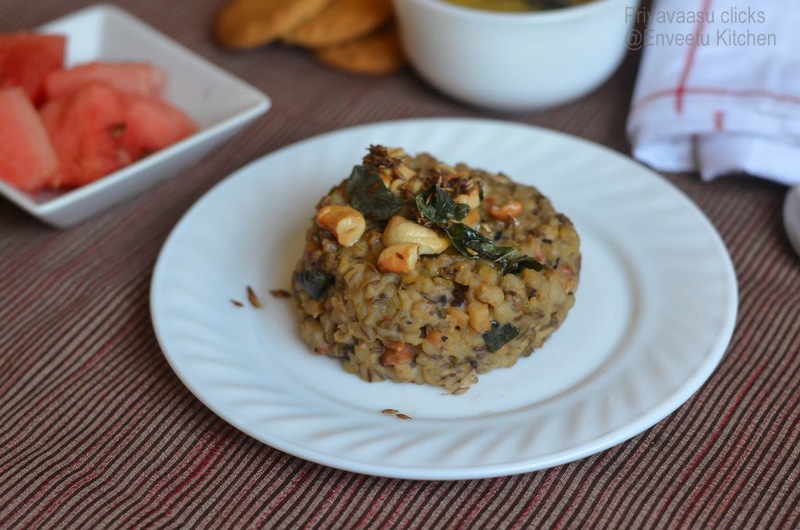 Grind urad dal first by adding enough water to a smooth batter. Remove it to a deep bowl. Grind jowar next by adding enough water. Jowar will grind to a almost smooth batter. 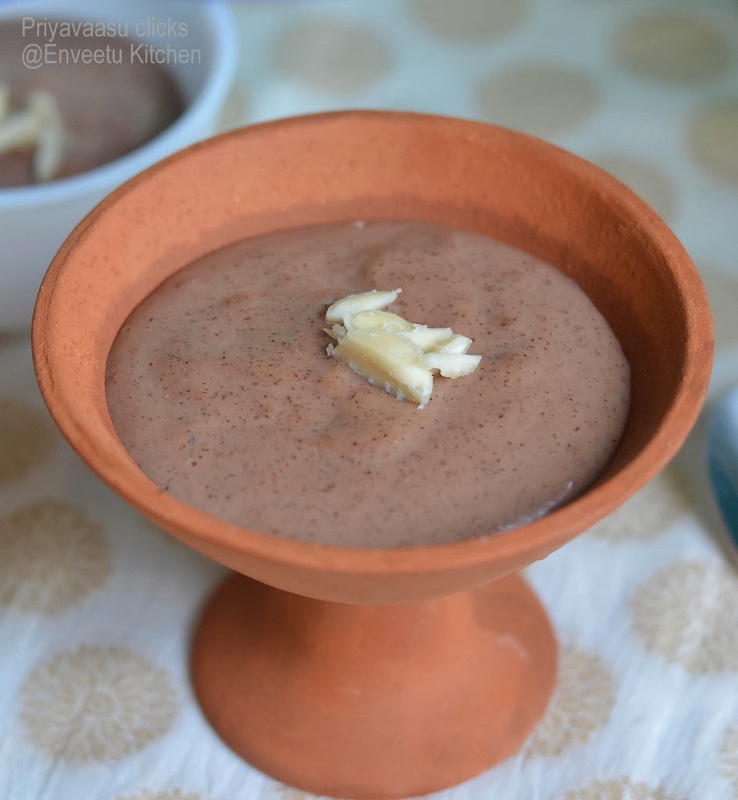 You will see brown specks of jowar in the batter. 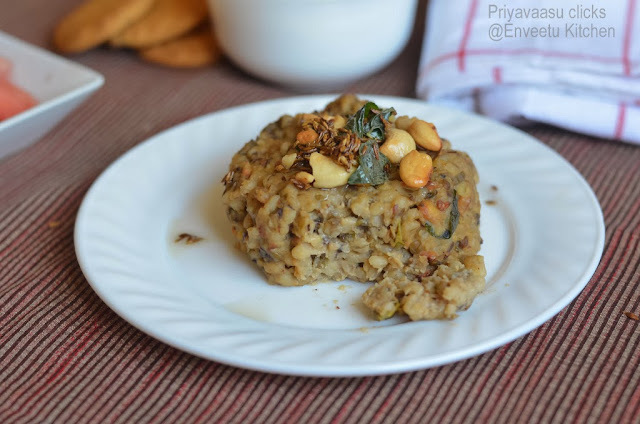 Mix both jowar and urad dal batter together. Let it sit on the kitchen counter for 8 hours for fermentation. If the climate in your place doesn't cooperate well for fermenting, then leave the batter inside the oven with the lights on. Next day morning, add salt to the fermented batter, give it a good stir. Heat the tava /non-stick pan, pour 1/2 tsp oil and wipe clean all over the tava using a tissue or a cut onion. Pour a laddle of batter in the centre of the pan and spread it thin from the centre in a circular motion. Dot the edges of the dosa with ghee/oil. Cook until the edges turn brown, flip and cook the other side too.Serve hot with chutney or sambhar. You can make thin/thick dosa's with this batter. 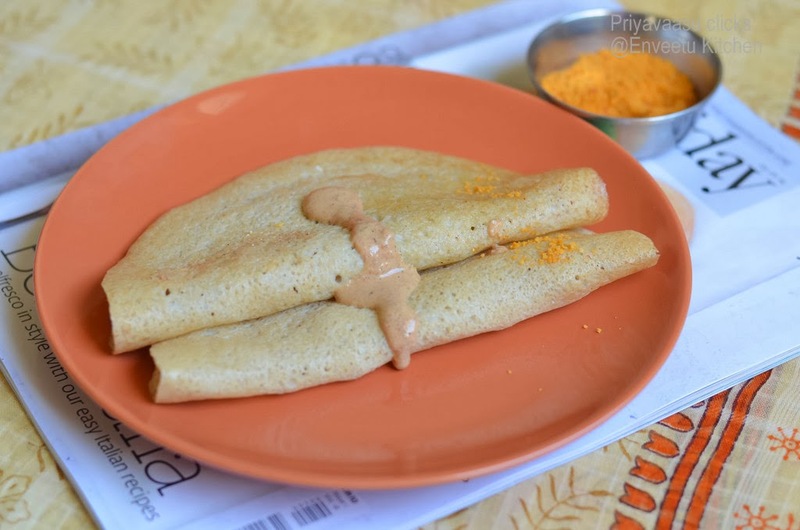 I served the dosa's for our weekend breakfast with peanut chutney and idly podi. A very happy new year to all of you. Hope you all had a great party on the New year day!!! We had a cozy evening at home. My brother's family joined us and we watched Guinness Record Fireworks display at Palm islands Live on TV. Evening's are getting very cold here, so we thought it is good to be at home with the kids. It has become customary to begin a celebration with something sweet. But i was a bit hesitant to overload us with sugar. 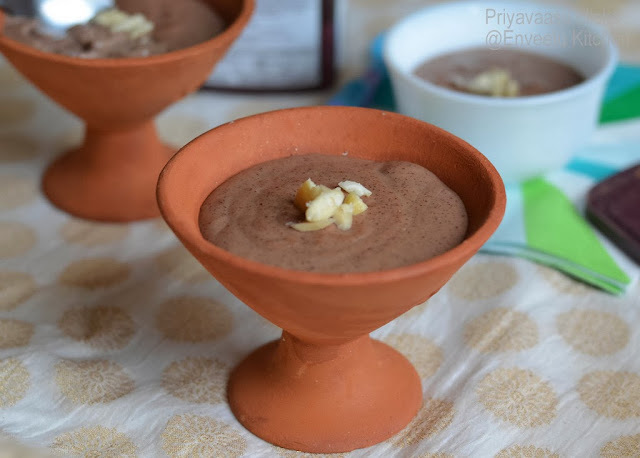 So, i made this Ragi Chocolate Pudding, simple, yet satisfying our taste-buds. 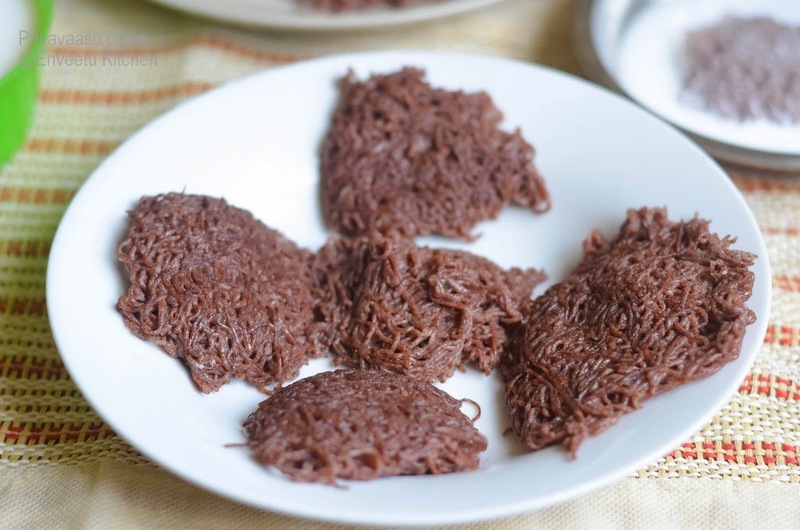 Since it has chocolate, your lil ones too would love to taste it. 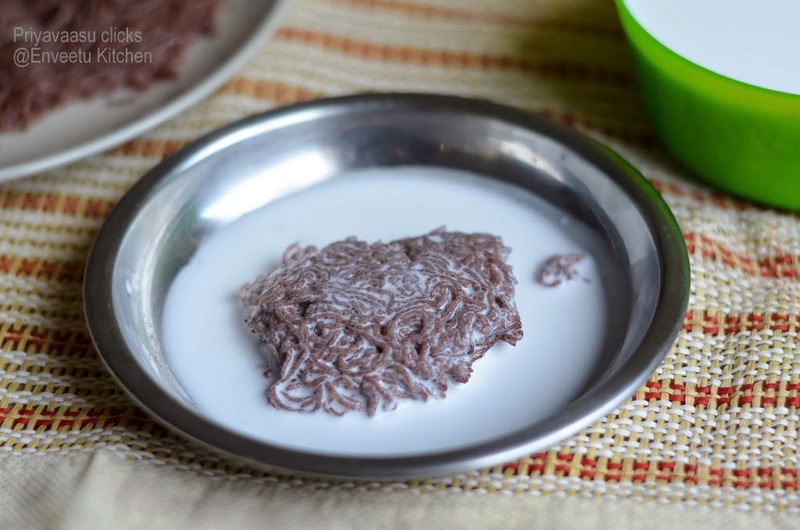 Take 1 cup of milk in a saucepan and heat to boil.Take ragi flour and cocoa in a small bowl, add 1/4 cup of milk and make a smooth mixture. When the milk starts to boil, reduce the flame to simmer and slowly add the ragi-cocoa milk mix to it and whisk well to combine. Add the remaining milk and sugar to this. Cook this in a medium flame to about 10-12 minutes until the mixture thickens. Take it off the flame. Serve warm or pour into small cups. Refrigerate until serve. 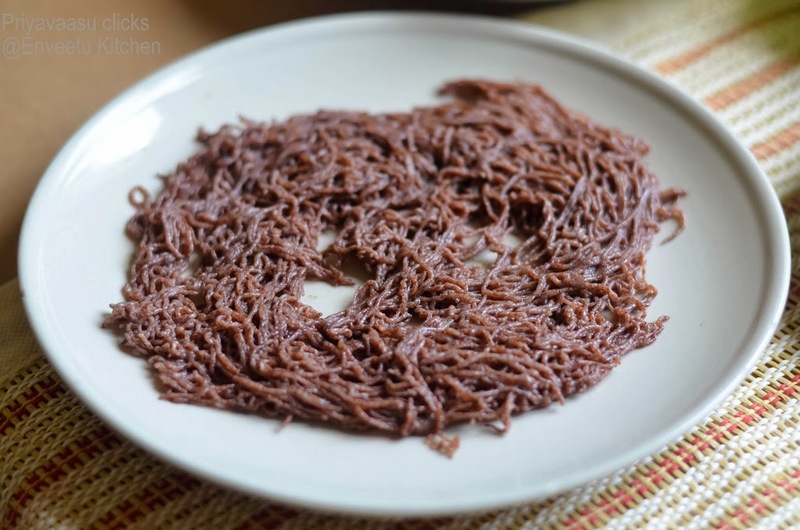 It is a perfect breakfast dish, but can also be served as a light dessert. If serving as dessert, garnish with roasted nuts and chocolate shavings. 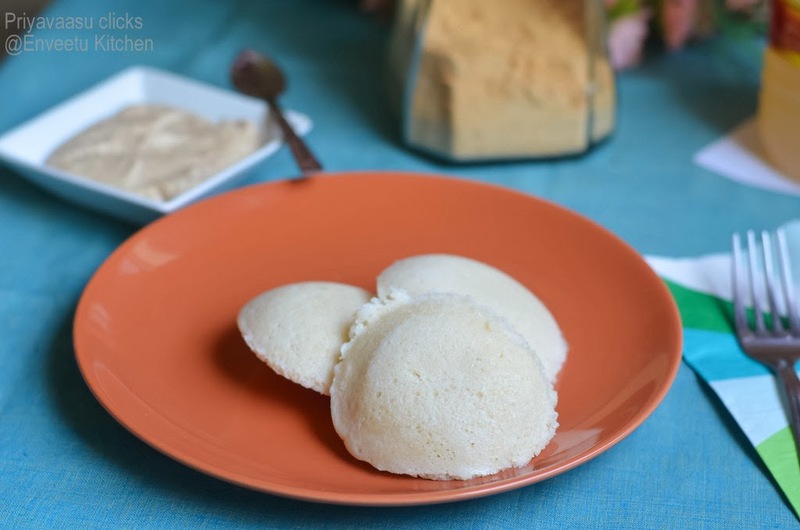 If you don't have brown sugar, you can use white sugar too or try using powdered jaggery. In case if you feel you have added more milk than neccessary or pudding isn't thickening, try adding a tsp of oats.